All right, haven't played Desteria in ages. just check forums from time to time. Mr_DagALkeef_B7 and smh8 like this. Thank you for your huge custom enchantment suggestion thread. Mr_DagALkeef_B7, StormerSage, Mae and 1 other person like this. Yep! Back on the grind for /mctop 1. It's pretty much why I'm still here lol. 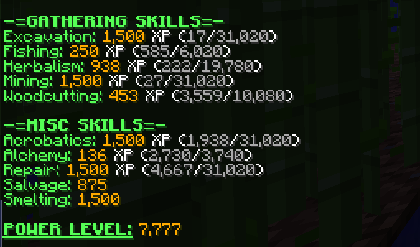 Though I will be checking out the custom enchant realm, and if I can transfer my rank there, I might go there. Will be on in a few days. The realms don't currently all reset at the same time, so I recommend you stay tuned. The community has no idea when a reset is impending for quite a while. Nobody knows that she's a lonely girl... And it's a lonely world. Mae and KikiInuyoshyy like this. *sees #Queen title* Welp, there's something I've gotta get soon. Narwhalogy and Aeris like this. Zey, Zeezy and Narwhalogy like this. Sepre, which means it's gone soon. But I'm gonna grind again. Building cactus farms since 2014!